The Singleton of Dufftown Malt Master Selection is a pleasurable, easy drinking, and accessible single malt with a smooth texture and predominantly sweet taste. ?First rate: accessible and easy to drink. It will certainly appeal to consumers who enjoy lighter styles of Speyside, but it has plenty of character? - Charles MacLean, Whisky Expert. Hints of honey and vanilla coupled with fresh pear on a faint base of wood ash. Enjoy it neat to experience the notes of fresh fruit and vanilla. Aged in barrels hand-selected by Craig Wilson, Master of Malt, and finished in three distinct barrel types: refill, sherry and bourbon. Its smooth flavour make it the perfect gift for new single malt whisky drinkers. 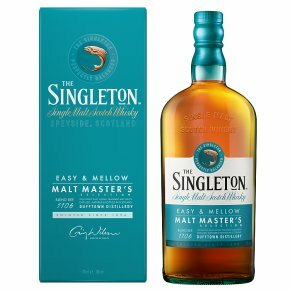 Aged in barrels hand-selected by Craig Wilson, Master of Malt, and finished in three distinct barrel types: refill, sherry and bourbon, The Singleton of Dufftown Malt Master Selection is a pleasurable, easy drinking, and accessible single malt with a smooth texture and predominantly sweet taste. Enjoy it neat to experience the notes of rich fruit and vanilla or with a drop of water to unlock layers of flavour. Or with tonic for a refreshing and enjoyable long drink.